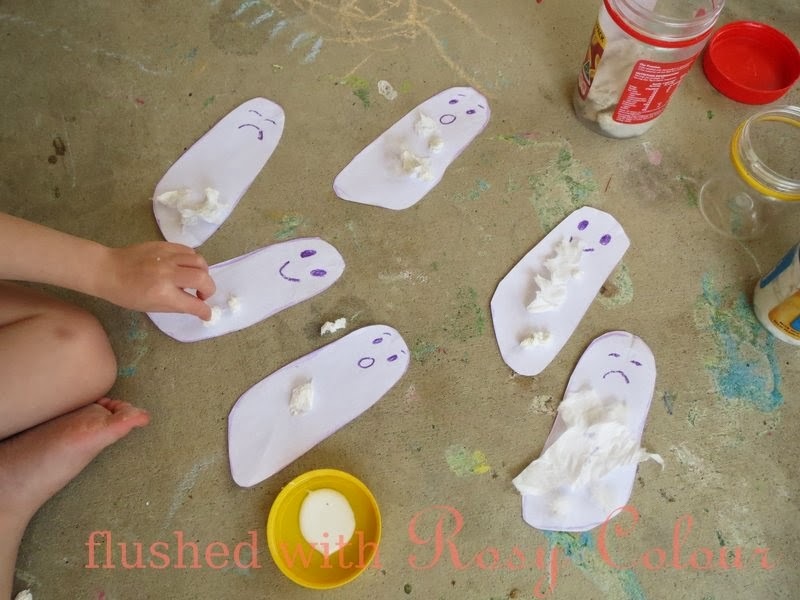 I tried this craft activity last Tuesday based on a couple of activities on Toddler Approved. I started by tracing out 6 footprints which Thomas enjoyed saying it tickles! Then we talked about some emotions and I drew happy, sad and surprised onto the 3 pairs of footprint ghosts. We then played some matching games with the ghosties for a few minutes, Thomas was able to identify the emotions on the ghosts. We spent a little time ripping up white tissue paper and rolling some into balls, then we went outside to glue the paper onto the ghosts. We also glued on a little of the home-grown cotton, I just need some straws to turn these into puppets!